Zindagi Tv Indian Premium Tv Channel is releasing new shows in the Month of October 2015 . 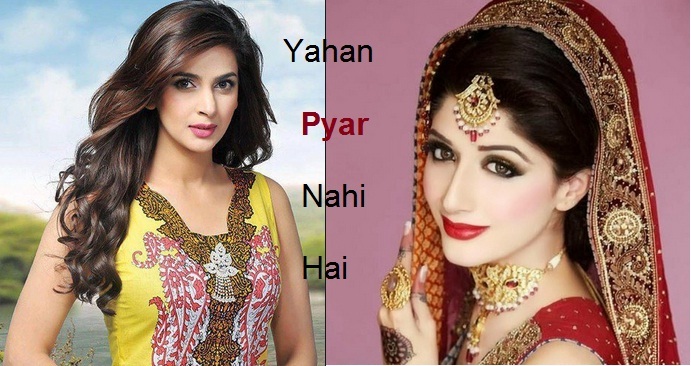 'Yahan Pyar Nahi Hai' is an Upcoming Tv serial which is going to be start Soon. This Upcoming Tv Show Story is written by Faiza Iftikhar and this show is directed by Fahim Burney .The show is produced by Syed Afzal Ali. In Pakistan, this Tv serial was same named as 'Yahan Pyar Nahi Hai' and aired on Hum tv. Saba Qamar & Junaid Khan playing lead role in this show and this serial is one of the most popular Tv Shows in Pakistan. 'Yahan Pyar Nahi Hai' is the story of a miserable couple—Saim and Haleema. Saim does not like his wife, Haleema and never loses any opportunity to humiliate her. Another character in the plot is Haleema's cousin, Shumaila. Shumaila lures Saim towards her and away from Haleema. Does Shumaila's brother Sabih, manage to save Saim and Haleema's marriage? What will be the future of Haleema and her children? Promo of the Show 'Yahan Pyar Nahi Hai' is available .